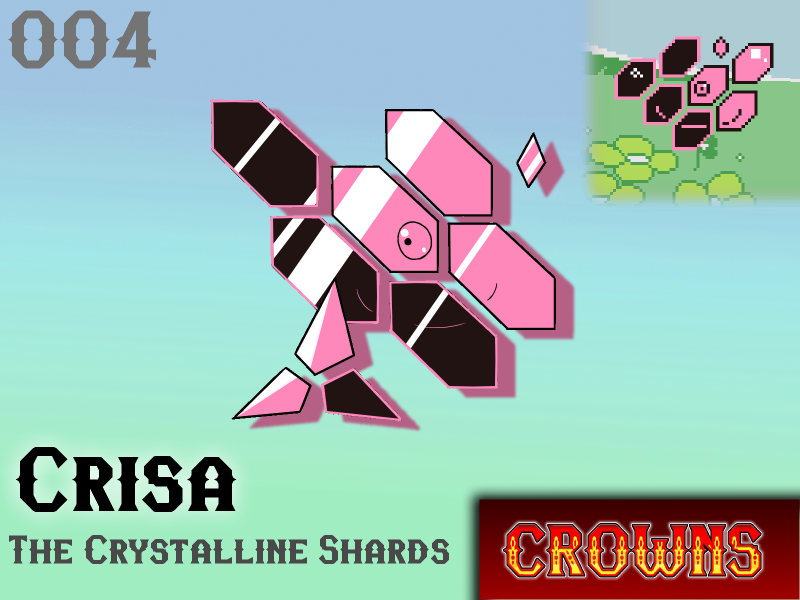 Crisa are commonly found in dark forests, and occasionally in caves. Their body is comprised of shards of opaque pink and black glass (the number of shards varies depending on the individual) that spin, twirl and reconfigure in shape as it floats through the forest. Said to be the byproduct of powerful magic, they seem to possess an incredible ability to mystify and confuse those lost deep in the forest. Carefully twirling and reflecting light across its body, they aim to bedazzle whatever being happens to pique their interest. Crisa seems tireless, performing for days without any sign of exhaustion. Some researchers believe that despite Crisa's inorganic appearance, it may have inspired the myths of woodland fairies, or perhaps that its habit of playing with and reflecting light may be the unintentional source of otherwise unexplained forest-fires. Will Crisa make your team?